It’s one month to Christmas Eve and my mind has been turning to advent calendars. I always seem to end up panic organising these at the very end of November (or worse yet, buying small advent calendar fillers a day or two ahead throughout December, one step ahead of the sher-elf) so this year I decided that I would be organised and make sure that I had things ready in advance. Behold, my book advent calendar. Now I know that this might look a little excessive, but advent calendars have become big business in recent years, so I’ll sometimes buy a beer or beauty advent calendar as a gift for a relative who is very into a particular hobby, so I thought, why not a book advent calendar? While I’m sure that you can buy a book advent calendar, making your own book advent calendar allows you to tailor it to the recipient’s genre preference, for example, a crime fiction advent calendar, young adult fiction advent calendar or romantic fiction advent calendar… the ideas are endless while buying the books second-hand saves a lot of money while making it a gift for your friend and giving a nod to worthy charities at Christmas. For my advent calendar, I scoured a local charity shops to find recent fiction paperbacks and on average these cost me 50p each, so you can easily buy the books for under £15 if you hunt around for bargains. The brown paper was inexpensive, and you could use string instead of ribbon, or do as I did and buy a large roll of cheap organza ribbon that can be used for the rest of your Christmas wrapping. 24 books, wrapping paper, ribbon or string, coloured markers, decorations. When the books are wrapped, try out different stacking formations until you are happy with your design. Once you’re happy with your final design, number the books with a coloured marker so that you can remember their final position in the stack. Once the books are numbered, take the stack apart and decorate them with any string, ribbon or embellishments that you want to add. Go wild with the Christmas decorations, have a cookie and a cup of tea. NB. This is to make a 24 book advent calendar but you could easily customize this for a different time period, or do the twelve days of Christmas instead. This entry was posted in Craft, Gift Ideas and tagged advent calendar, books, Christmas, Christmas crafts, craft, gift ideas on November 24, 2018 by Siobhan. If you’ve dipped even your little toe in the murky waters of social media recently, I’ll bet that you’ve seen an advert for some kind of subscription service. From make up to meat, surprises to sanitary towels (no, really) it seems that there’s a subscription box for almost everything, though until recently a monthly box for book lovers has been a pipe dream for those in the UK. But no more! There are now a wide range of book subscription services for bookworms in the UK, so you don’t have to pay a huge postage fee to enjoy a monthly book box from across the pond. And, dare I say it, it seems to me that UK bookworms actually have a more grown up selection of book subscription packages to choose from? If you’ve ever had wall art envy for an amazing framed literary quote, you’ve probably come across a print from Bookishly. They’ve recently branched out from creating word art with Vintage books and have created a book club that sends out a monthly package containing a vintage book, a luxury tea sample from Jenier World of Tea and a curated item of stationery. If you know a bookworm who loves to curl up with an old book and a cup of tea before writing a thank you note on beautiful stationery, then the Bookishly book subscription is the gift for them. Or you, if you fit that description. Curated by Daphne at Winged Reviews, Illumicrate is the new heavyweight on the book subscription box market and it really packs a punch. Filled with items that match the Illumicrate ethos of “fun, beautiful and geeky” this larger subscription box is released monthly. The perfect gift for a reader who is passionate about their contemporary and young adult literature, the former teacher in me also thinks it would be the perfect way to lure a reluctant reader into exploring literary worlds. If you’re looking for a special gift for a loved one but don’t necessarily share their literary tastes, the the Chocolate and Book Subscription box service can help you out. Better yet? The box comes with a load of delicious chocolate to eat while you read. The chocolate and book subscription service has a wide range of genre book subscriptions, including thriller, chick lit, sci-fi and YA, so they have a package to tickle every bookworm’s fancy, if their passion is for horror, thrillers or romance as long as they have a sweet tooth. They cater to a range of dietary requirements and you can order a one of box, or a longer term subscription package. Founded by Adam and Chloe Pollard in 2012, The Willoughby Book Club provides a personalised book subscription service with some really clever package options. Not only do they provide a Contemporary and Classic packages for those who want to hone their reading in a particular direction, they also provide hobby subscription packages for cooks, gardeners and natural historians. The Willoughby package I like the sound of most is, sadly, not for me… The Couples Book Club package which sends out two copies of the same novel so that you can read it together and discuss it. My boyfriend may make wonderful cups of tea and buy me the books I am embarrassed to be seen with in bookshops, but a reader he is not! Still, I think it would make a great gift to share with a close friend and it really is a genius idea. I was really excited to come across Books That Matter, a monthly subscription box which aims to deliver books which explore important themes to enlighten readers on key issues and themes such as gender, race, culture, class, ethnicity, ability, sexuality, politics, or history, along with at least two gifts by independent female-identifying or non-binary artists. The boxes supply fiction as well as non-fiction books that explore their particular theme, and while this might be of interest to male-identifying allies, the gifts that came with my Brexit-themed box were a floral necklace and pocket mirror. I think that this box subscription would be the perfect present for a difficult to buy for teenage girl. This entry was posted in Gift Ideas and tagged books, gift ideas, gifts, reading, self care, subscription boxes on February 24, 2016 by Siobhan. If you want to make your own marmalade, and eat your sandwiches as Paddington Bear, intended, it’s pretty easy following this handy how to make marmalade guide from the BBC. 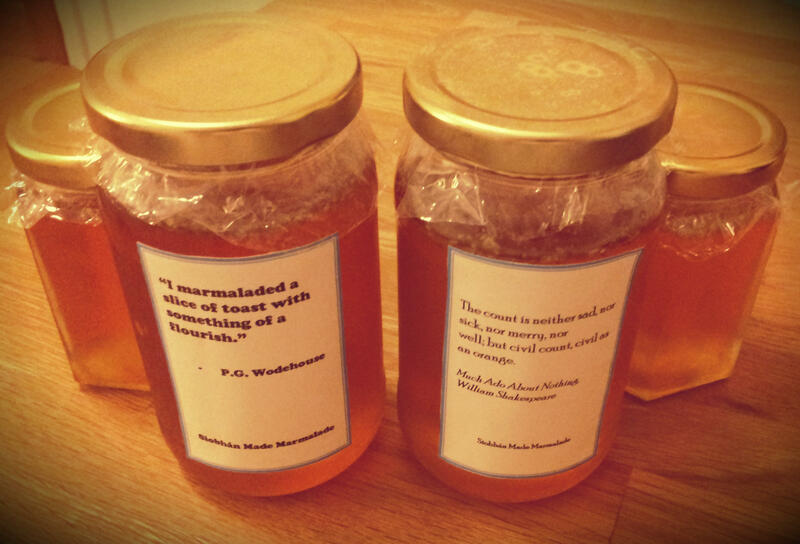 Geeky literary quotes about Seville oranges and marmalade on the label are optional, but great fun. This entry was posted in Craft, Food, Gift Ideas and tagged books, food, lifestyle on January 28, 2014 by Siobhan. I love this Alice in Wonderland Necklace inspired by The Mad Hatter’s Tea Party which is £14.50 from Notonthehighstreet, a bargain gift for any book lover. Sherlock Holmes fans will appreciate this quirky magnifying glass necklace, £25, but it’s a great gift for anyone who keeps misplacing their reading glasses as the dainty magnifying glass is a working model. Fans of Patrick Rothfuss will be excited to receive their own set of Eolian Talent pipes, available from his website for $50. Whether that is any substitute for the long-awaited but yet-to-materialise third book, who can say. Fans of The Great Gatsby can get this adorable bow tie necklace with one of the best quotes from the novel for just £14.50. I wonder whether F. Scott Fitzgerald ever sobered up in a library? This Alice in Wonderland brooch/pin £18 is super cute and would be great for keeping your scarf in place. I have trouble styling scarves (or anything) but a cool present for someone who is a little more sartorially minded. Birdcages are pretty timeless, so this lovely Jane Eyre quote necklace is a must for Bronte fans at just £12. And for anyone who was looking for something a little more literal, this cute book necklace this simple silver fairytale book design is my absolute favourite. I wear mine with almost everything. This entry was posted in Gift Ideas and tagged books, fashion, gifts, jewellery on November 19, 2013 by Siobhan. If you’ve forgotten Valentine’s Day, instead of the obligatory perfume, chocolates and flowers which reveal your faux pas why not give these bookish alternatives which offer a thrilling, and sometimes chilling, take on the love story. The dark tale of a man who becomes obsessed with a quest to bottle the ultimate perfume by capturing the scent of young women. A compelling novel, this has the added kudos of being Kurt Cobain’s favourite novel. In 17th century Amsterdam, Sophia is trapped in a loveless but comfortable marriage to a much older man when she falls in love with a passionate young artist. An engaging read with art, intrigue and tulipomania. A film is rumoured to be in the works for 2013 so appear cultured by giving this to your beloved before the bandwagon gets rolling! This entry was posted in Gift Ideas and tagged books, gifts, shopping, Valentines on February 13, 2012 by Siobhan. Alice in Wonderland is universally popular because of the whimsy and nonsense that fill every page. It means different things to different people, but no one can deny that it is one of those stories which has sunk into the British public’s collective consciousness to the point where the Mad Hatter’s Tea Party was included as a scene in this year’s Marks and Spencer Christmas advert alongside scenes from Christmas classic film of choice The Wizard of Oz and panto favourite Aladdin. If you have an Alice in Wonderland fan in your life, they would love any of the following gifts. I’d be happy to add this pretty Penguin Hardcover Classic version of Alice’s Adventures in Wonderland and Through the Looking Glass to my collection. It is a work of art on the outside and is complete with the original Tenniel images. For crafty Alice fans, Everything Alice is a must have. One of 2011’s most popular craft books there is something for everyone in this gorgeous book. Given that the Alice in Wonderland bedspread from Urban Outfitters has sold out, this will give you some good ideas for Alice in Wonderland style decor for the home. And speaking of trinkets this Drink Me pocket watch is also amazing. It doesn’t scream Alice in Wonderland, so readers and non-obsessives alike will love it but it would make a nice vintage-style touch to any outfit. I really love the Alice in Wonderland afternoon tea set pieces from Mrs Moore’s Vintage store which I think were on sale at Liberty a few years ago, but this tea pot has to be my favourite piece. I’ve seen a lot of amazing Alice in Wonderland themed jewellery (I have a pretty funky Disney Couture bracelet that I bought myself in my youth…) but I have never seen a piece of Alice in Wonderland jewellery as unique as this incredibly intricate locket… a once in a lifetime present for an Alice in wonderland fan. If you want to decorate your tree with a touch of Alice in Wonderland, then the British Library has an amazing set of tree decorations inspired by the stories. You can go Alice, Hatter, Cheshire Cat, Flamingo, but my favourite is this cute Smoking Caterpillar tree ornament. This entry was posted in Gift Ideas and tagged alice in wonderland, books, Christmas, entertainment, film, home, lifestyle, shopping on December 8, 2011 by Siobhan. I recently went to my great-aunt’s 80th birthday party and was presented with these amazing little books. 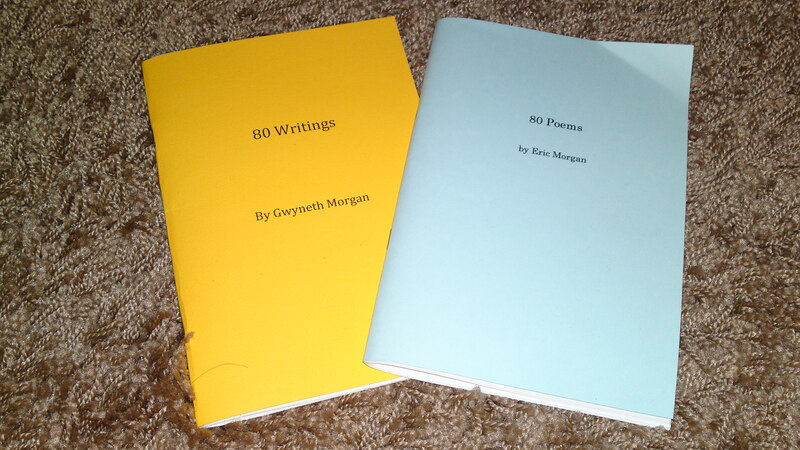 My cousin had them made for her mother and father who write poems (though my great aunt calls them writings) as 80th birthday presents and they contain 80 poems/writings that they have each written. 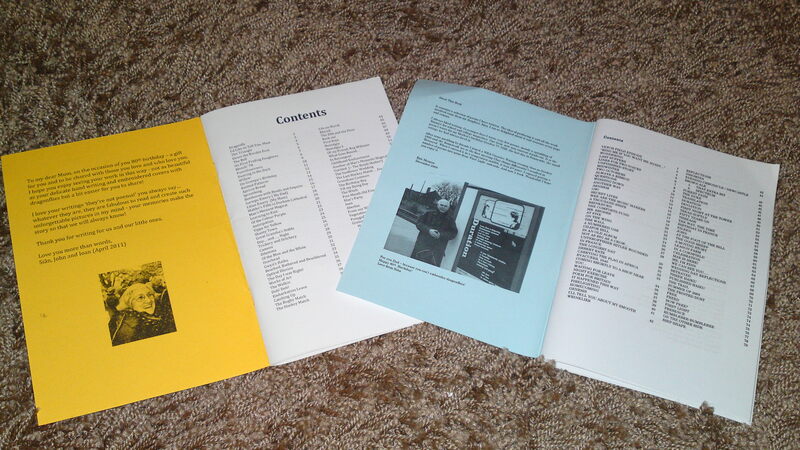 She had lots printed so they could send them to family and friends. Not only are the poems really impressive, but my great aunts poems contain a lot of family history and remembrances which was just lovely. My cousin is known throughout my family (and the world!) for being incredibly kind and thoughtful, but I thought that this was just the most amazing present, not just to my Auntie and Uncle but to the family as well. This entry was posted in Gift Ideas and tagged books, poetry, writing on May 22, 2011 by Siobhan. I’m not a philatelist (stamp collector, but how cool is that word?) though I did once buy the royal mail Dracula and Frankenstein stamps to decorate my diary. I was about 9 at the time, and stamp prices weren’t quite as ridiculous as they are now. It was a short lived obsession, and while I do appreciate a nice stamp, stamps are not a major obsession for me. However, I think I might be forced to rethink this after a colleague in work showed me these amazing book related stamps on The Royal Mail website. I don’t know if I mentioned that I’ve decided it might be time for me to go back to old fashioned correspondace, but I have started sending a lot of letters to my friends living elsewhere, because who doesn’t love a proper letter? I think I might have to buy these. This entry was posted in Direct Speech, Gift Ideas and tagged art, books, stamps on March 29, 2011 by Siobhan. I was introduced to this little shop on the weekend, and I could have spent years in here. It’s an amazing treasure trove of wax seals, leather journals, quills and assorted oddities. If I could have bought the entire shop, I would have. They don’t really sell reading books, the only books on display were some very expensive folio editions (cheaper to become a devoted member of the Folio Society and purchase heavily for a time) but if I ever win the lottery I will be going back to stock up my desks. I can see me now writing in a leather-bound tome with gold engraving, writing in an elegant script with a peacock feather quill and rainbow coloured inks. The perfect place to act out your Romantic/Gothic/Medieval/Harry Potter fantasy. This entry was posted in Direct Speech, Gift Ideas and tagged book shops, lifestyle, my life, Oxford, presents, quirky, shopping on January 11, 2011 by Siobhan.